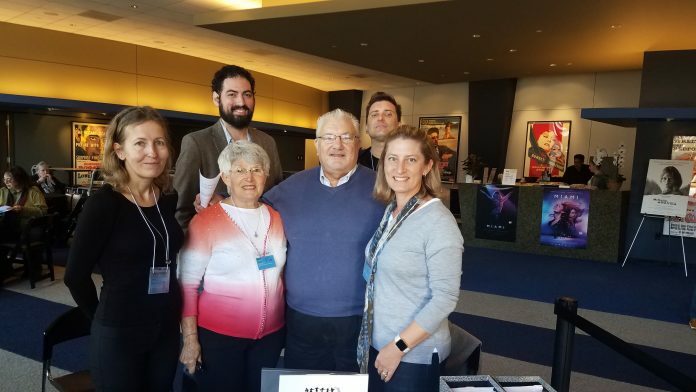 My experience at Scandinavian Film Festival LA 2018 didn’t disappoint! Not only did I see many great movies, but this year I added another component to my festival experience. I was a volunteer. On Opening Day, festival newsletter subscribers received an email reminding them of the event and it also happened to mention “Beloved volunteers– we DO NEED YOU!! !” I am not one to let that plea go by without action if I’m available. My offer to help was quickly accepted. Over the two weekends of the festival, I welcomed festival guests and sold tickets. I spent time with wonderful festival organizers and other enthusiastic and friendly volunteers. Being a volunteer made it all so much more meaningful. Getting to know festival organizers James Koenig and Flo Niermann and hearing about their experience with the festival over the years added to a much greater understanding and appreciation of the event. Compared to other film festivals, this is a small one. But it’s very welcoming and friendly. Many festival goers come for multiple screenings. They hang out in the lobby between films. They chat and enjoy food from the Nordic Café. James Koenig, the festival founder/director, is a constant presence. He greets guests very warmly and often with a hug if it’s a familiar face, and he introduces every film. For me the festival provides an opportunity to go back to Norway through language and setting or to be an armchair traveler to another region in the area. An unexpected perk of being a volunteer was receiving a festival pass and being able to see whichever movies I was interested in while I was there. Since I was there for many hours over the two weekends, I saw more movies this year than any other year. I saw four films the first weekend, the very first one being Sweden’s Oscar submission The Square by Ruben Östlund. I was very grateful to see it with my volunteer partner. The movie started out fine and enjoyable, but then it took a turn that left us with many unanswered questions. We both appreciated having someone to discuss the movie with afterwards. One of my favorite films of the festival was shown in the first weekend, Denmark’s short film The Dolphin by Laurits Munch-Petersen. It was about a mother who wanted her son to be able to finish a swimming course. In 29 minutes, it managed to evoke a whole range of emotions, and the ending, an unexpected one, tied all the pieces together perfectly. I also saw Iceland’s Under the Tree by Hafsteinn Gunnar Sigur∂sson. This movie seemed to cause very varied opinions among festival goers. It’s about two neighbors’ disagreement over a tree’s shadow. This is a relatable issue; access to sunlight is highly prized in the Nordic countries. What starts as a common neighborly issue quickly spirals out of control, at times comically, other times darkly. I was one of those who enjoyed the film. I wrapped up the first weekend with Norway’s supernatural thriller Thelma by Joachim Trier. It took place mostly in Oslo but also along Norway’s western coast. I wasn’t sure it would be my type of movie with its supernatural elements, but it worked for me and I enjoyed it. The second weekend was a little slower for me due to family obligations. Saturday evening I saw another favorite movie of the festival, Sweden’s feature film Strawberry Days by Wiktor Ericsson. It’s about the son of a Polish guest worker and the daughter of a Swedish farmer. They slowly but surely fall in love, but their relationship is not acceptable to either side. It wasn’t clear to me exactly what happened in the end, but the dramatic ending was definitely understandable considering all the issues that were at stake in this situation. Strawberry Days (trailer) from ArtOfficial Agency CPH on Vimeo. The last film of the festival for me was Lithuania’s Frost by Šarūnas Bartas. This was an odd experience because it was nothing like descriptions I had read beforehand. I was expecting a movie about a young Lithuanian man’s alliance with two reporters as they deal with the turmoil of war in Ukraine and he is “forced to overcome psychological limits and build strong relationships.” He does meet reporters along the way, but they don’t continue together. Instead, the movie is about this young man’s fascination with war and his desire to understand it. His sullen girlfriend comes along on the road trip from Vilnius to Ukraine. I did not understand the characters’ motivations. And the ending did little to make up for the slow and dull journey. The only interesting part of the movie is towards the end when viewers get a little insight into the Ukrainian war and what life is like for Ukrainian forces holding off separatists. I wonder if the film underwent some major editing after film descriptions were published. Films that I was unable to see but heard were worthwhile or ones that were highly anticipated included Denmark’s You Disappear and Across the Waters, Iceland’s Summer Children, and Norway’s Late Summer. I’ll have to keep an eye out on Netflix for those movies. If you attended the festival or have seen any of the movies elsewhere, I’d love to hear your thoughts. This entry was posted in Film & TV and tagged film, Joachim Trier, SFFLA by Patricia Zanuck. Bookmark the permalink. Thanks, Patricia, for alerting me to your very informative post about SFFLA. Really appreciate your comments and your view point on the whole festival experience as a volunteer. Also enjoyed going back to view some of your posts on the festival in previous years. “To go back to “Norway” through language and setting” seems to be the primary reason for which festival attendees show up. They love the beautiful scenery from Scandinavia; they treasure hearing the films in their native language and discussing them over coffee & Danish with native speakers. It takes them home. The film people are there, of course, but the Scandinavians make the festival. Thanks again.